Trade negotiations and the threat of global tariffs are contributing to significant volatility in the financial markets. Although applicable in many ways, the Smoot-Hawley protectionist act of 1930 is unfairly emphasized as the primary point of reference for understanding current events. In 1944, an historic agreement was forged amongst global leaders that would shape worldwide commerce for decades. The historical precedence of post-WWII trade dynamics offers a thoughtful framework for understanding why trade negotiations are so challenging. This article uses that period as a means of improving the clarity of our current lens on complex and fast-changing trade dynamics. Folklore states that Robert Johnson went down to the crossroads in Rosedale, Mississippi and made a deal with the devil in which he swapped his soul for musical virtuosity. In 1944, the United States and many nations made a deal in Bretton Woods, New Hampshire. The agreement, forged at a historic meeting of global leaders, has paid enormous economic benefits to the United States, but due to its very nature, has a flawed incongruity and a dear price that must be paid. In 1960, Robert Triffin brilliantly argued that ever-accumulating trade deficits, the flaw of hosting the reserve currency and the result of Bretton Woods, may help economic growth in the short run but would kill it in the long run. Triffin’s theory, better known as Triffin’s Paradox, is essential to grasp the current economic woes and, more importantly, recognize why the path for future economic growth is far different from that envisioned in 1944. The financial crisis of 2008 was likely an important warning that years of accumulating deficits and debts associated with maintaining the world’s reserve currency are finally be reaching their tipping point. Despite the last nine years of outsized fiscal spending and unprecedented monetary stimulus, economic growth is well below the pace of recoveries of years past. 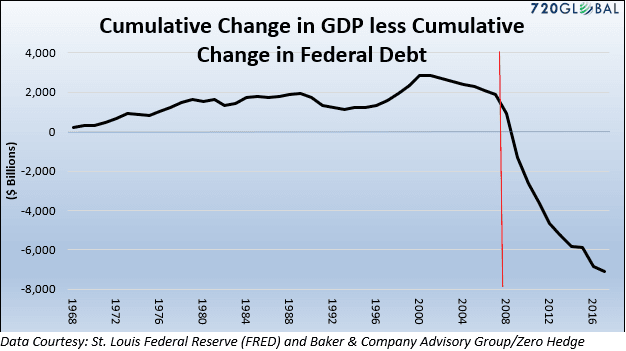 In fact, as shown below, starting in 2009 the cumulative amount of new federal debt surpassed the cumulative amount of GDP growth going back to 1967. Said differently, if it were not for a significant and consistent federal deficit, GDP would have been negative every year since the 2008 financial crisis.